Michael Chabon, writer of glorious essays , hilarious shenanigans , and pulpy masterpieces, has a new book out this week (at least in the US) called Moonlight. I am literally more excited about this than anything else in the world. By which I mean that I’m not, really, but I am. Sometimes, it feels like the only thing that matters, but then, usually, I end up thinking about other things. That’s art for you. Sometimes everything, although, of course, not. Doree Shafrir, profiling Michael Chabon, in Buzzfeed. Mr. Chabon is one of contemporary literature’s most gifted prose stylists, and in novels like “Telegraph Avenue” and “The Yiddish Policemen’s Union,” he’s demonstrated his Jedi-like mastery, his ability to move effortlessly between the serious and the comic, the existential and merely personal. In “Moonglow,” he writes with both lovely lyricism and highly caffeinated fervor. He conjures Mike’s childhood with Proustian ardor, capturing his fond memories of his mother (who smelled of Prell shampoo, making him think of those old TV commercials showing a pearl languidly drifting through the mentholated green) and his worst boyhood fears (convinced that a gaggle of evil-looking puppets were lying in wait, plotting to kill him). He makes Oakland, Calif., in the 1970s come alive — and does the same for Baltimore in the 1950s and Florida in the late 1980s. The book won’t arrive in the UK until January. I could, of course, buy an e-book when it comes out in the US. Although, of course, I won’t do that. Most likely, while waiting for this new book, I will return through the various wonders of Chabon’s past, tangling with my tendency towards aetataureatean delusions and flying with joy through the galactic air of his prose. Hello, readers. Felicia Day periscoped herself watching herself in Supernatural. She expressed it thus, “I’m alone in a hotel room sharing a live video of watching myself on TV. This is the modern age.” Another fantastic element of our modern age is William Boyle. He’s a human, through and through, and sometimes titles his blogs, ‘death in the world’ and also he has appeared on television, even. 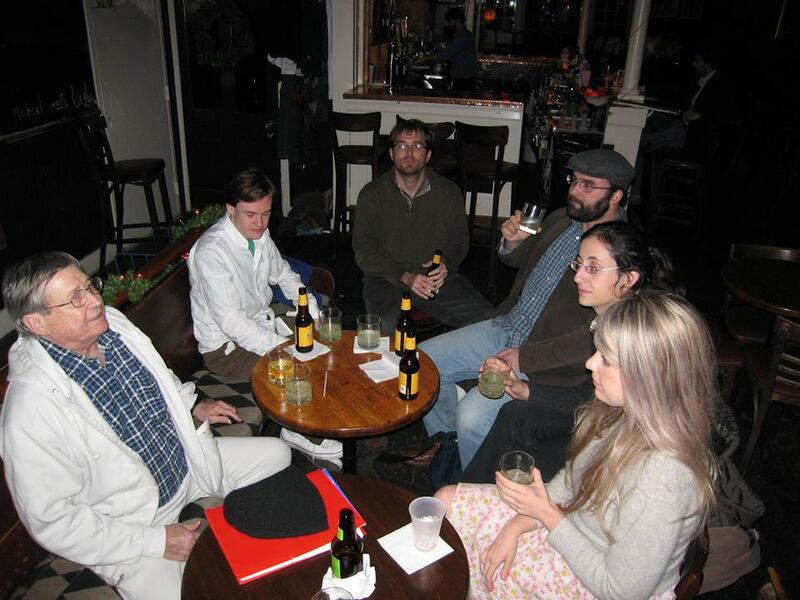 We shared a few drinks in our time at City Grocery, and, one day, we will again. Here’s us and Barry and the gang. He also writes wonderful things. His stories punch you in the heart and ask if you’re okay and then hug you and punch you and that’s how it is with life. He just did a reading at Oxford’s Off-Square Books for his new collection, DEATH DON’T HAVE NO MERCY, that I wished I could have attended but oceans. Alas. Feel free, though, like me, to compensate for your lack of skills re:traveling through space and time (the modern age has connected everyone and still we end up so far apart) by reading all the wonderful things on the internet related to my faraway friend. Here he is at largeheartedboy, taking part in Book Notes. Death Don’t Have No Mercy” is an early story, written in 2007. I pretty often take a title of a song I love and play off of it. I was listening to this obsessively back then. I knew I wanted to write about bad luck and trouble and the meanness of the world. The lyrics hit so hard. No matter what you think, there’s death waiting at the end of everything. Shut up and put your ear to the floor. Here comes big bad death. It doesn’t care what you know or don’t know. It’ll cut you down blindly. Here he is in an interview with Nerve. You can understand a lot about a character by knowing what he listens to. I’m not trying to make a character listen to a certain type of music to make him seem cool. Or to make me seem cool. Music can be a lonely occupation. A character in one story makes a mixtape for a girl he’s slept with. I can remember staying up late at night making mixtapes. It was a lonely experience and kind of wonderful. Cassettes are sad, too. There’s another character in the story “Poughkeepsie” who still listens to Alice in Chains. He’s stuck in that moment from the ‘90s. And I understand that. I have great empathy for those people. I understand that feeling of nostalgia for hearing something for the first time. Or associating what you heard in the past with the only time you felt good in your life. Here’s a link to a Spotify playlist Bill made for DEATH DON’T HAVE NO MERCY. Fantastic. Music and film and tv and Whedon played a large part in many of our talks. He’s a damn fine fellow and you should go buy and follow him. I am. Happy Thursday, readers. ttfn. Sometimes you read a book to remind yourself of something you already know but don’t know how to live with. Several years ago, possibly on several Tuesdays, you could find me curled up in a comfy chair located near the back of a Barnes & Noble’s. I didn’t have very much money. The chair was very soft and very near a great many books. I used to sit in that chair and read books the library didn’t have. And also write. One of the books I read in that chair was EATING ANIMALS by Jonathan Safran Foer. The thing I knew but didn’t know how to live with was two things. 1) Animals for to be eaten were, and are, generally treated in a way that I didn’t support. 2) The system of factory farming pollutes and that didn’t seem too good either. After reading Foer’s book, I decided to commit to being vegetarian. I could have committed to meatless mondays, or meatless weekends, or any number of things that might cut back on my consumption of meat. But, well, I didn’t choose those other things. I chose the first. Two days ago, I bought CLIMATE CHANGED by Philippe Squarzoni. It’s a brilliant walk through the science of climate change framed through Squarzoni’s own life and his own love of stories, particularly films. After I finish this book, I don’t know what I’ll do. Sometimes I wonder how much of the money we raise to fight malaria and other such things is money that only exists because of the present state of things. Sometimes I wonder if climate change is a movie we came in half-way through and the ending’s already set. No one wants to deprive themselves of things. The thing I know but don’t know how to live with is two things. 1) The present state of things can’t last. 2) Something has to change. That is my mood at the moment. In less than a month, I’m flying back to the U.S. to visit love and sort out bureaucracy. Maybe buy a new phone with a more awesome camera. These things will bring joy to my life. No one wants to deprive themselves of things is a thing that Squarzoni says in CLIMATE CHANGED, and it’s true. I grew up inside of the evolution of global warming discussion from possible to definite to denied to omgisittoolate? It’s always seemed real and just another thing for humanity to handle. Which we definitely would. Because clearly we’ve lasted this long. But. Well. I wonder how much energy it takes to post a blog? In the flat at the moment, with drying clothes hung over radiators and a very warm delicious cup of tea in an orange mug resting on a coffee table which is, in fact, actually, a very large foot stool. It’s pretty awesome. Another thing that’s awesome is outside. By which I mean, all of outside. It looks, well, I don’t know. I left my words behind yesterday. Let’s say it looks like the inside of a nickel, which makes it sound less awesome, but, well. Yesterday, I left a comment on the internet. Today, happily, it appears that a day or so ago John McCain left a comment on things as well and it, very much like the sky, is more awesome than you might expect. I’m going to embed it here because I watched it and cried. Before 9/11, my concept of the United States of America was just beginning to complicate itself, and after that, it became wonderfully complicated. I very much cared about when and how and if and in what manner we went to war and I was upset and then we clearly tortured people and it was wrong and now we drone people and that seems wrong and also we kill unarmed people, in part, because whether or not they have guns doesn’t matter, since the social construct of race and poverty continues to demonstrate that however much we may think make believe is something we stopped playing as children, we actually still play make believe all the time and the stuff we make our beliefs has profound, tangible consequence. If tl;dw, here’s how The Daily Show reported it. And also, because, happiness. Here’s some list of books you might want to read. Make believe being as powerful as it is, it’s useful to get some exercise making believe outside of your experience as much, and as often, as possible. Stories are empathy machines. They’re like treadmills for your conscience. Or something. There’s an excitement in the air, or possibly the soil, or maybe the clouds, and there’s a question for you, are the clouds a part of the air? Is the wind? Are you? Once, there was a book called THE INVENTION OF AIR, which is a great phrase as phrases go. I wonder if the author of that book would say he was made up mostly of air, or clouds, or heart. I wonder if anyone’s ever written a book called THE INVENTION OF ME. If they did I bet it would have to go back a long way. Probably before television, but after the big bang. Sometimes I also think about the first person who ever thought. Not about anything in particular. Just thought anything at all. Right now my other wonder is whether or not the invention of me came before, or after, the invention of you, or if it was concurrent. Concurrent being a cool word we should all use more because once you accept the fundamental interconnectedness of all things, it’s not a big leap towards accepting the fundamental concurrentness of all time. Except, sometimes it’s too late. Which is sad, but probably for the best. If everyone was always on time for everything then a lot of things would probably never get invented. It’s the things that steal our time and take our air away that generally invent who we are and sometimes that means we miss out on other things. I’m not sure where this is going, but here we are. John Oliver interviewed this amazing human at one point in time and I watched both parts this morning and this is part of my excitement. This weekend, EG and I met up with a girl whose initials are IY and I will use those initials because it might stand for I & You, even though it doesn’t, though that’s pretty close to you and me which we were talking about earlier. We met up at a coffee shop over near Bloomsbury. It didn’t have a bathroom. It did have some lovely peppermint tea and a coat rack on which to hang our heavy, London in December coats. While we were there, one of the baristas looked at EG’s sketchbook and made happy noises. The three of us talked about our books and our futures, which is a way of saying we talked about the things we were hoping to invent, things that none of us could see, but we were happy to imagine how we might pull them out of the air and make them real and read by others. I have been working on my book for a while, and not saying much to EG about it, keeping all the excitement to myself, putting it on the page, and it was nice to take this get-together as an excuse to talk a bit about it and listen to their thoughts and this is part of my excitement, too. I don’t have a link to this excitement, though. Not yet. Just wait. You’ll read it one day. The sun’s already setting. It’s a London in December sun. It rises late and goes to bed early. December 21st is coming up, though. Almost to the mid-point, the solstice, halfway out of the dark.